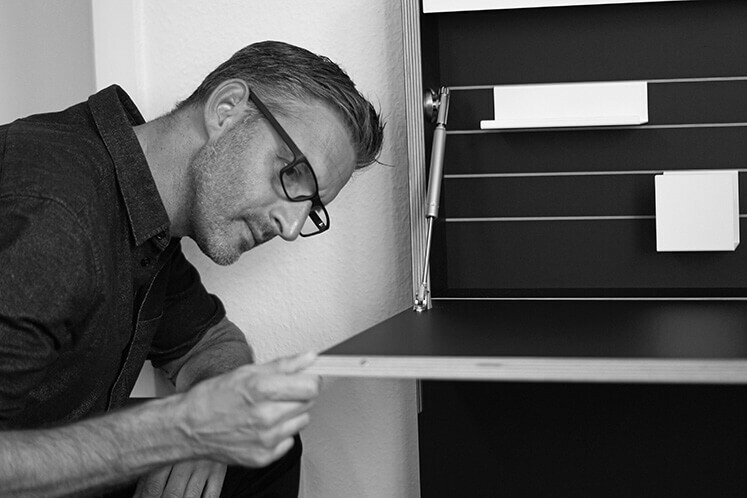 Michael Hilgers, a trained cabinetmaker and architect, founded his own office for interior and product design in 2001. This was followed by several interior design projects for international fashion labels. The (multi)functional, flexible and space-saving furniture developed in his Berlin studio has been awarded several times with the "Interior Innovation Award" and has already been shown in various museums. Michael Hilgers, who sees himself as a "designer finder", combines inventiveness with minimalist design. It is particularly important to the designer that his products adapt to today's lifestyle. Especially in urban areas, space is becoming increasingly scarce and his creative designs offer innovative and at the same time astonishingly simple solutions, such as the ultra-flat secretary,"Flatmate" or the picture frame/wall secretary "Flatframe".